What do Four Seasons Los Angeles, Beverly Wilshire, the Fairmont Miramar, Malibu Beach Inn, Four Seasons Westlake , The London West Hollywood & the Peninsula Beverly Hills have in common? Other than being hotels in LA, each has an amazing restaurant--so good you might even forget you're dining in a hotel! Gone are the days when hotel dining was nothing more than a necessary evil as these properties offer up seriously great eats...in fact, the meals I've had at these hotels rival some of the best I've had anywhere in LA. Take for example, the newly opened Culina at Four Seasons LA. Billed as "modern Italian cuisine", the chic spot is a far cry from the traditional Four Seasons "Restaurant" that formerly occupied this space. Think crudo bar (Italian-style sushi), homemade pastas, freshly grilled fish (the yellowtail with artichokes and olives is a personal fave), thin-crust pizzas and creative desserts served in a stylish & warm ambiance, indoors and out. Evening cocktails on the patio (pictured) by the fireplace are a lovely start or end to any meal prepared by the charming Chef Victor Casanova (and yes, that's his real name!). Sister property Beverly Wilshire wins my award for best breakfast spot in LA. Not only does its BLVD restaurant pack in more powerful Angelenos than typically gather in one room, but outdoor tables with a Rodeo Drive view and amazing dishes like an exotic mushroom omelette, steel cut oatmeal brulee & fresh dairy-free smoothies of the day. (side note: For a gluten-free glutton like myself, I love the fact that they have homemade gluten-free bread!!). BLVD is the ultimate all-day dining spot and I'm not kidding when I say I'd be happy eating breakfast, lunch and dinner here. Added bonus: Full breakfast comes included in our Four Seasons Preferred Partner rates! For special occasions, yet another Four Seasons takes the prize. I had one of the most memorable Thanksgiving meals last fall at Four Seasons Westlake, where a three-room buffet filled with Thanksgiving fare also included amazing sushi and seafood creations courtesy of Chef Masa Shimakawa. Chef Masa oversees the Japanese-inspired Onyx restaurant, where Asian BBQ Thursdays & "Sushi on the Rocks" Happy Hours are fun ways to try out unique hotel dining. Families also love the Sunday brunch at Hampton's with its special VIK (Very Important Kids') surfing-inspired display. For dining with a view, Carbon Beach Club at the Malibu Beach Inn is the hands-down winner. Simple and fresh California-style cuisine--lunch & dinner faves include crab & avocado salad, a lobster club, veggie (or real) burger, Asian chicken salad & Ahi Tuna tartare--is best enjoyed at an oceanfront table as close to the beach as it gets in SoCal. It's one of the best true beachside dining options, and one that should be experienced more often buy both locals and guests. Beachside breakfast is also a great option, as are desserts (trust us, the rasberry cobbler is sinfully good). 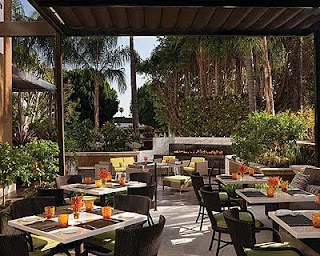 A few additional lunchtime faves, which I've enjoyed on numerous occasions are FIG at the Fairmont Miramar , Boxtree Cafe at the London West Hollywood and Belvedere at The Peninsula Beverly Hills. Funny enough, the Peninsula's former chef is now at the helm of FIG, which offers the most fun & creative (not to mention delicious) dishes using nothing but the freshest farmer's market ingredients. Chef Ray Garcia's takes on gourmet grilled cheese, homemade (cream-free) tomato soup, grilled fish tacos & no-pasta veggie lasagna were hits at our table, while another diner told me the ultra-fun Sunday "kegs & eggs" brunch is his favorite weekend treat. The Belvedere's garden patio is not only discreet and peaceful, it's the perfect backdrop for indulging in creative comfort food (truffle mac & cheese, crispy fries, cobb salads, and my fave, grilled barramundi). Should you prefer something lighter, simply head upstairs to the Roof Garden where you can dine poolside on organic, healthy cuisine. Another great choice for breakfast, lunch, afternoon tea and weekend brunch is Gordon Ramsay's Boxtree Cafe. While he may not be in the kitchen, the unique menu is definitely Ramsay by design. Beautiful presentations and creative takes on California-inspired served in a light-filled bistro setting are reasons to remember Boxtree when the lunch locale choice is yours. Book stays at any of the above hotels through Elite Travel International and we'll ensure you'll not only be VIP'ed during your stay, but you'll enjoy one of the best tables in the house! For more information, visit www.elitetravelinternational.com, email elitetravelgal@gmail.com or call 310.979.9036.
are made with the finest materials such as stainless steel and 18K gold and are water resistant to depths of 300M.